In May of last year, I attended the Cleveland Clinic’s Patient Experience: Empathy & Innovation Summit and returned pretty excited about the growing presence of user experience thinking in the world of healthcare. Patient Experience, a young but emerging field, is introducing to healthcare the notions Service Design thinking brings to the service industry. The Beryl Institute defines it as, “The sum of all interactions, shaped by an organization’s culture, that influences patient perceptions across the continuum of care.” Essentially, it translates to the intentional design of every interaction a client has with a healthcare organization, “before, during, and after delivery of care,”[i] intended to improve the experience and, consequently, the end result. and of course, Information Technology. Think valet parking, room service, music therapy, fine art displayed in traffic areas, and effective but visually pleasing architecture. If it sounds more like a hotel stay rather than a hospital experience, you should know that many healthcare systems are hiring from the hospitality industry to achieve it. And for the fast-changing industry, it aids healthcare providers in achieving all the quantitative data scores necessary to maintain federally legislated status and funding. All of this effort stems from a patient-centric business model. The Cleveland Clinic reported that all staff, including custodial, housekeeping, and food service employees, is trained to respond to patient call bells. Of course a housekeeper can’t provide clinical care, but he or she can respond to a patient’s request with a smile, deal with minor concerns, or personally alert more qualified staff. The benefit in all of this belongs first and foremost to the patient. A more calming or satisfying experience actually allows healthcare providers to treat their patients more effectively and inexpensively. When healthcare providers transformed the culture of their organizations to be patient-centric, as opposed to organization-centric, they yielded increased customer satisfaction and were frequently able to administer improved care. In Patient Experience, better experience empirically produces better results. A poignant example of patient experience in application was described to conference participants by Kurt Newman, MD, Chief Executive Officer at the Children’s National Medical Center (CNMC). Traditionally, children requiring MRI’s need some degree of sedation to calm symptoms of stress, which can interfere with scan accuracy. Sedating a child, however, is traumatic in itself, and incurs costs of administering medicines. 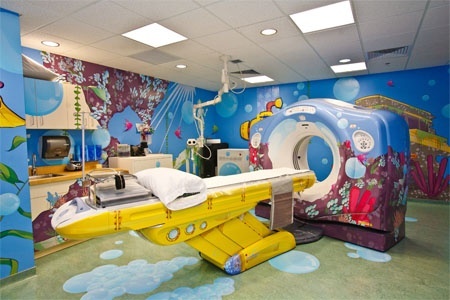 At the CNMC facility, the MRI bed is disguised as a yellow submarine in a room decorated like an underwater coral-reef. Children tested in the whimsical room tend to require significantly less sedation, if none at all, than those tested in a typical MRI facility. Their increased comfort in the unfamiliar environment minimizes stress symptoms, producing more accurate scans. This saves all parties tremendous costs, allows the provider to more effectively treat the patient in the long-run, and spares the child fear and discomfort, which is easily one of the more rewarding outcomes for the family, patient, andmedical professional. This imaginative answer to a long-established problem was surmounted by patient-centric and thoughtful design. This line of thinking is incredibly compelling to Red Privet. Imagine the impact research-based design can have across the continuum of care. Way-Finding technologies in hospitals could ease the frustration of a frightened family member searching for a loved one in the ER. In-room bedside monitors can provide a patient with information about prescribed medicines and usage, answering questions about recovery time and progress. Continually improved at-home technologies will allow a patient to convalesce in the comfort of his or her own home, and still remain in communication with the primary care provider. The majority of hospital trips inspire fear or dread, feelings of vulnerability and questions about the future. These trends in healthcare strike a poignant chord with Red Privet as they answer old problems with thoughtful solutions, reflecting our commitment to improve the world through good design. We look forward to our continued and increased involvement in this sector in the future.